I know, it's almost March. These cookies are completely out of season. But I'm catching up on my blogging and these are too good to go unpreserved! 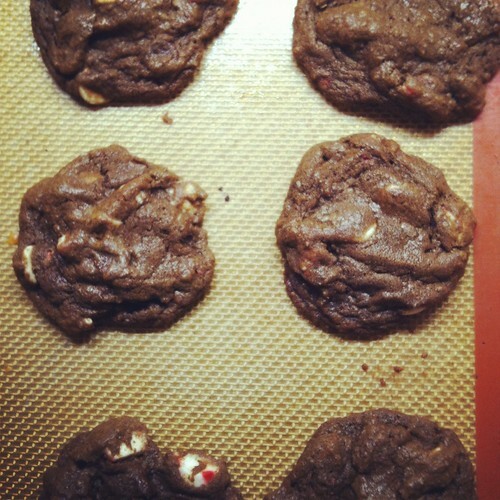 I made these back when candy canes and peppermint extract were readily available. If you're a chocolate and peppermint fan, bookmark or pin these for your next round of holiday baking! If you're the impatient type, I bet those round red and white peppermint sucking candies would work well instead of candy canes. 3. Using a medium cookie scoop (or a tablespoon), drop cookie dough in balls onto the prepared baking sheet leaving about 2-inches between dough balls. Bake for 10-12 minutes until the cookies are cooked through. Let cool on the baking sheet for 2-3 minutes before transferring to a wire rack to cool. I haven't had the chance to tell you how happy I am to see you back to blogging!